1. Prepare cake mix following package directions for cupcakes. 2. After cupcakes have cooled, use a butter knife or cake decorating bag and tip, and cover the top of each cupcake with frosting. 3. Top each cupcake with a Peeps marshmallow shape. -To color the frosting, divide frosting into separate bowls and add a drop or two of food coloring to each. Stir to blend. 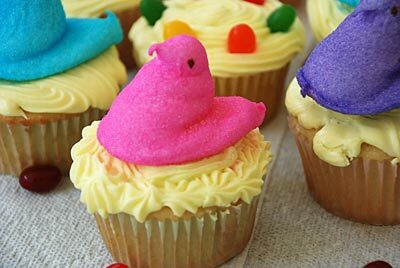 -Sprinkle colored sugar or tinted coconut over the frosting before topping with a Peeps Marshmallow Chick. -Cover a serving tray with Easter grass, sprinkle with jelly beans and add the Peeps cupcakes.